The OJO wins points for its small size, powerful speaker and bright image, but the low resolution and high cost prevent it from being a product we can recommend wholeheartedly. 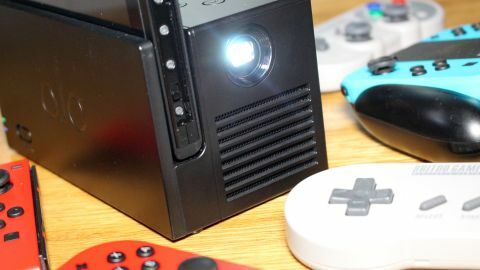 Billed as the world's first mini-projector for the Nintendo Switch, The OJO beams an image of up to 120-inches in size onto any flat surface, but also serves as a power bank and spare dock for your Nintendo Switch. Powered by Texas Instruments DLP technology and packing a 20,400mAh battery that offers up to four hours of usage on a single charge, the OJO also doubles as a portable speaker system and can even be used with other consoles thanks to its HDMI-in support. The device was made possible by a Indiegogo crowdfunding campaign last year and is now available to the public. The OJO Indiegogo campaign ended in December last year and raised $274,035 from almost 1000 backers. The first units are now reaching the hands of those who made the whole thing possible, but the OJO is also available to the public via Amazon UK and US. It costs $399 / £399. The OJO is surprisingly compact when compared to other projectors on the market, measuring just 170 x 85 x 83mm – it's only a shade larger than the standard Nintendo Switch dock, in fact. This portability is a real boon as it means you can effectively take the big-screen experience with you wherever you go; the OJO is tiny enough to slip into any modest-sized rucksack or satchel. The OJO features a dock into which the Switch is inserted; once you've done this and powered it on, the Texas Instruments DLP 0.2” DMD LED projector works its magic. At the other end there's an array of ports, including HDMI input, two USB 3.0 ports, a single USB Type-C port for charging and a 3.5’’ audio socket, which means you can link the OJO to a traditional audio system if the incredibly loud build-in speaker is somehow too quiet for your liking. On the top you'll find a set of controls which adjust the volume and the picture focus. The bottom of the unit has a kickstand which allows you to angle the OJO to get the best possible picture, and thanks to the gyroscopic built-in sensor, the unit automatically angles the image to suit so you don't get a distorted projection. The system can compensate for quite sharp angles of elevation, and is handy for those times when you're using the OJO in quite a small room. The OJO can be operated from the mains using the bundled power supply, or you can run it off the internal Panasonic-made 20,400mAh battery. This is good for around four hours of gameplay, and thanks to the included USB ports can be used to charge your Switch and other devices, like your smartphone. When using the OJO away from the mains it automatically reduces the brightness to conserve battery, but it's still bright enough to see. If you want maximum brightness at all times, you'll have to ensure you're always close to a wall socket. Keeping things cool are two fans build into the unit – a 11000 RPM turbo fan for the projector itself and a second 7600 RPM fan to ensure that the Switch console doesn't get too toasty. These get pretty loud during use, but thankfully the unit's speaker is powerful enough to drown out the noise. When we're talking about projectors, there are two main points to consider: luminance and resolution. It might surprise you to hear it but 1080p HD projectors are still quite expensive these days, despite the onset of the 4K revolution in the realm of television sets. Even 720p projectors remain pricey, so try not to be too shocked when we tell you that the OJO can only output 854x480 pixels. That's sub-HD, just in case you needed it spelling out any further. Eek. When you're blowing an image up to 120 inches in size that's quite a low resolution, and as a result a lot of games look blocky and text is sometimes hard to read. It's not quite as disastrous as you might think, though, and everything is still perfectly playable – even if a little bit of clarity is missing. In terms of brightness, the OJO hits 1200 lumens with a contrast ratio of 1000:1. In a totally dark room it looks really striking, and it's even possible to make out what's going on in a partially-lit environment. It goes without saying that OJO is at its best when the curtains are drawn and the lights are all out, but you'd be surprised at how versatile it is in other conditions, too. Thanks to Texas Instruments' technology the image is colourful and clear, with decent contrast between dark and light areas. It won't challenge the results you'd get from a modern flat screen TV, but that should be pretty obvious – and a TV with a screen size of 120 inches is sure to cost you a lot, lot more than the £400/$400 being asked for here. The audio side of things is really impressive; the 5W speaker is incredibly loud at maximum volume and if you're brave enough to use the OJO outdoors then you may well get complaints from the neighbors (either that or they'll pop round and ask for a go on Mario Kart 8 Deluxe). The option to connect the unit to another speaker system via the 3.5mm connection is welcome, but we're not sure you'd need to do this unless you were a real stickler for sound quality. Alternatively, you could use this output for a pair of headphones. Beyond the low resolution we did notice some other problems with the OJO. The unit feels a little half-finished at times; during our testing period we experienced flickering images and a lack of audio, problems which were both solved by simply re-inserting the Switch into the unit. The Switch itself feels rather wobbly when it's docked with the OJO, and – given the recent furore regarding third-party docks bricking consoles – it might be wise to exercise caution before making a purchase. Nintendo itself advises customers to avoid using any unofficial dock with their Switch, although the creators of the OJO have stated that the unit has been fully tested and that they will take full responsibility for any bricked systems. The OJO's compact size is perhaps its biggest selling point; it's only slightly chubbier than the dock you get with the Switch itself and, once charged, it grants four hours of gameplay anywhere you can set it up. The Switch's portability is one of its key strengths, but being able to play the console on a massive 120-inch display anywhere you like takes things to the next level. It's packed with cool features such as an auto-angling image, charging ports and a surprisingly powerful speaker, and HDMI-in means that when you're not gaming you can use it like a standard projector for movies and other stuff. The resolution is really quite low, and for £400/$400 you might be better off putting your money towards a 720p or 1080p projector instead, even if it means sacrificing that appealing element of portability. There are some concerns with the build quality of the unit as well, given that we spotted a few irksome bugs during our testing. It's also a bit disappointing to see that the team behind the OJO is already hyping up the second generation unit, which will boast superior specs. Being able to play Switch games on a 120-inch display is pretty impressive, and we love the fact that the OJO is so easy to carry around with you; it's the perfect party companion. It's a shame then that the resolution isn't higher (the OJO 2 will apparently boast 720p so you might want to wait for that) and that the unit costs as much as it does; £400/$400 isn't exactly chump change. That said, if you're looking for a truly portable projector which interfaces elegantly with the Switch and comes with a range of other features, this is your only option right now.